Blake Hinsley won the prestigious Tanner Cup in Wellington last month. Photo Deb Williams. Cockle Bay teen Blake Hinsley has joined the ranks of some of this country’s elite sailors. 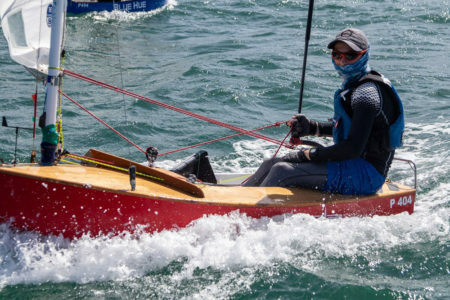 The Botany Downs Secondary College student just won the coveted Tanner Cup and joins the ranks of illustrious Kiwi sailors Chris Dickson, Russell Coutts, Dean Barker and Jo Aleh who were previous winners of the same trophy. Host, Evans Bay Yacht and Motor Boat Club in Wellington, reported that day two of the regatta was in stark contrast to day one, with a light southerly (under 10 knots) filtering down Evans Bay. “It provided a steady breeze and flat water for the final battle to be carried out. “Race four (the first on day two) saw a real shake up of results with the top two from day one having absolute shockers. The race was won by David Buchanan (Canterbury), followed by Valentine Kayrouz (Auckland) and Charlie Morton (Auckland) who all of a sudden raced back into overall contention. “Race five will be remembered fondly by the Kensington Family, who took out a one-two finish (Rowan just beating Sean across the line) and Rowan Berger (South Canterbury) having a fantastic race to finish in third. “At the end of race five the drop came into play and it was all on with the top two boats tied on 10 points. “So it was all coming down to race six, which Blake Hinsley took control of finishing with a bullet and the right to engrave his name on the Tanner Cup alongside many of New Zealand’s favourite sailors,” the club wrote. “Mason Mulcahy sailed a solid race to secure 2nd place overall and Charlie Morton finished off the overall podium. After winning the Tanner Cup, a regatta raced in the P Class, Hinsley also placed second in the Tauranga Cup the following day. Young sailors must qualify in their home regions to race in the Tanner Cup. Hinsley qualified first in Auckland. Hinsley’s parents Kerry Bright and Gavin Hinsley are over the moon with his sailing right now. “He was super stoked to have taken out the contest,” Kerry said. Hinsley, 15, started sailing when he was in Year 7. He began in Optimists at Howick Sailing Club, says mum, and moved up to P-Class last year and began racing out of Kohimarama Yacht Club. Hinsley has moved up to Starlings and is focusing his energy now on the nationals in April.